Curated by Matthew Perkins, ‘Red Green Blue’ brings together works from the 1970s through to the present day, drawn from the archives, artist holdings and the Griffith University Art Collection. Presented over three episodes, each running for a month, the exhibition takes the viewer on a historical journey that is also a celebration of the ongoing dynamism and depth of Australian video art practice. 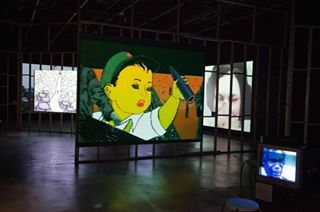 Emerging as an art form during the late 1960s and 1970s, video has continued into the 21st century as a prominent mode of artistic endeavour, with artists responding to the new possibilities opened up by advances in technology. From its earliest days, artists have embraced video’s radical potential – as a medium for artistic expression, a tool for political agitation, and a means with which to question the status quo. ‘Red Green Blue’ explores these intersections across its three themed episodes, tracing connections from early experimental origins through to the multiple and proliferating modes of today, to reassert the importance of video to Australian art history.